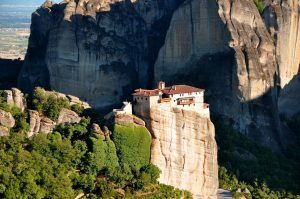 Meteora Monasteries - Organized Tours or Self-Guided Visits? Meteora monasteries are fabulous not necessarily because of their architecture but because of the giant rocks they are built on. This area, which is located in central Greece, boasts one of the most wonderful and intriguing landscapes on Earth. You can’t but admire these man-made constructions that seem to be impossible to reach unless you learn how to fly. 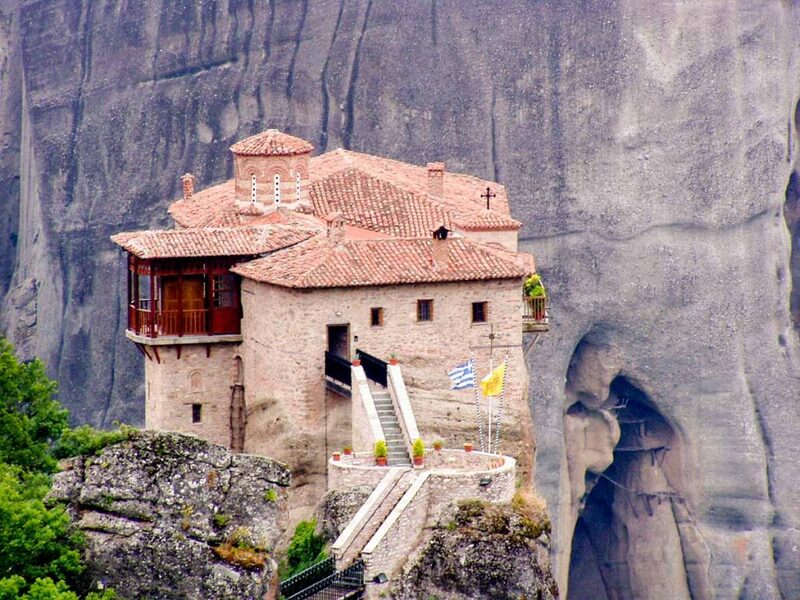 The Meteora monasteries are the second most important orthodox site in Greece, after Mount Athos. 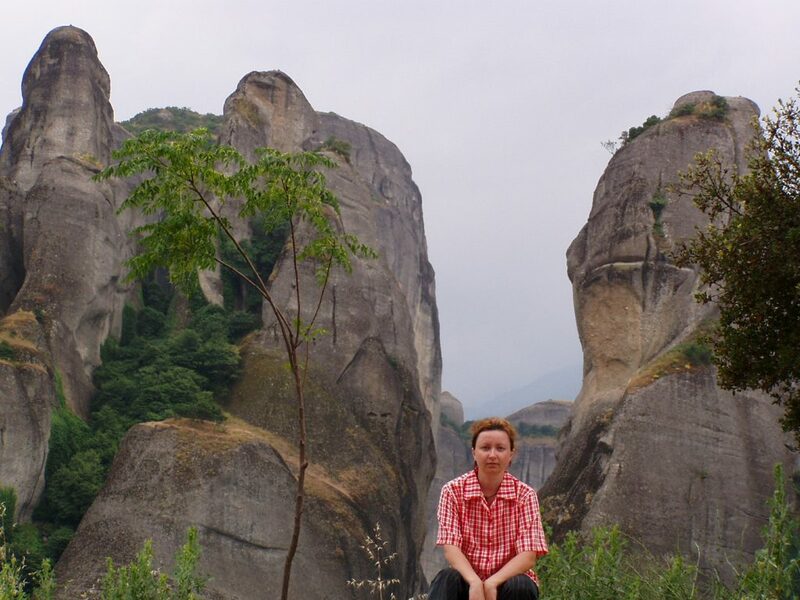 Unlike Mount Athos, though, Meteora monasteries can be visited by women. Well, for reaching some of them you have to be in good physical shape, as you’ll need to climb lots of stairs to get there. Meteora is a Unesco Heritage site in two categories: art and nature. This is one more proof that the natural landscape in majestic and surprising. These sandstone formations are amazing just as they are. When you add the beautiful monasteries on top of these rocks, the landscape becomes surreal. I’ve been fascinated with the seamless way the monasteries “grow” on these cliff tops as if they were natural and not man-made. 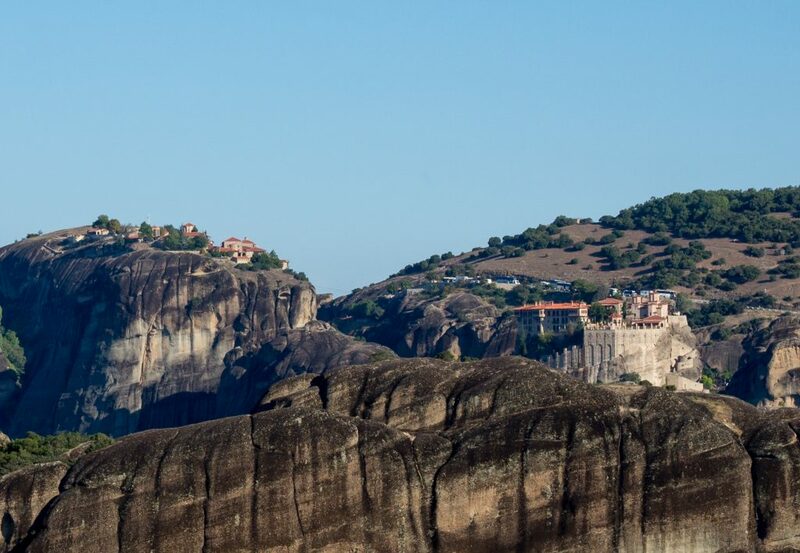 Where in Greece Is Meteora? The monastic complex at Meteora is located in Thessaly, in Central Greece, very close to Kalabaka (other common spelling variants of this name are Kalambaka or Kalampaka) and Trikala. 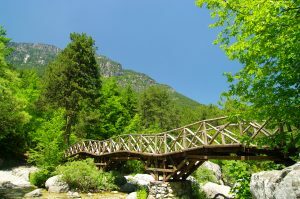 It is very close to the Pindus Mountains and the Pineios river. The road that leads here is very good, although curvy and rather narrow. Nonetheless, you don’t need an off-road vehicle to get to Meteora. Any car would do just fine, as long as you don’t fear driving at high altitude on the edge of the abyss. You don’t even need a car, as you can get here by either train or bus. Public transport offers you the great benefit of not having to take a look to see where in Greece is Meteora, as you’d only need to take a train or a bus to get there. 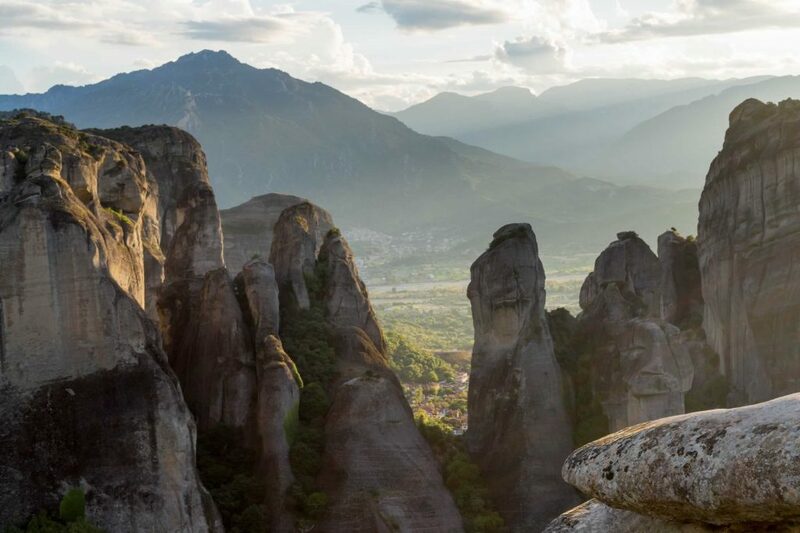 If I didn’t have my own car, I would have chosen a private tour from Kalabaka to see the rocks in the sunset, during the golden hour, or this 5 hour hiking tour of Meteora. 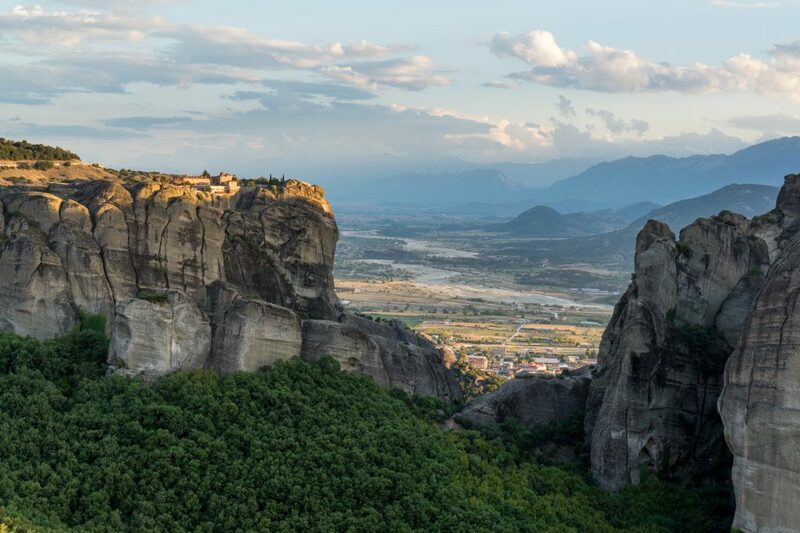 According to the German geologist Filipson, the huge rock formations at Meteora are the result of natural erosion caused by the river which supposedly covered what is today the Thessaly plain. Orthodox monks were too smart to allow all sorts of enemy hoards spoil their serenity. 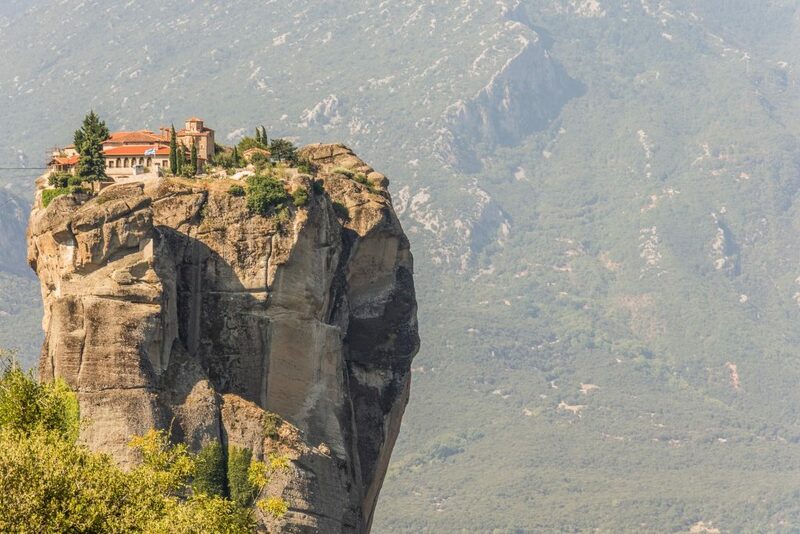 After living in caves for a while, the ascetics built the 21 Meteora monasteries on top of the sandstone megaliths, thus securing a life free from intruders. 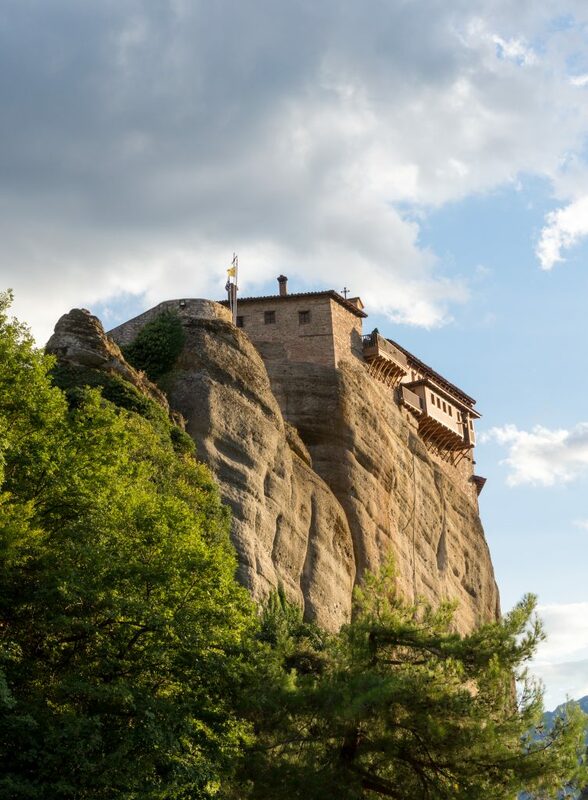 Most of these rocks on which the Meteora monasteries were built average 1,000 feet (300 m) in height, but there are some that reach 1,800 feet (550 m). You’ll feel very small as you’re going to stand there, on the edge of the road, looking up to the walls of those monasteries which seem to have been born from the rock itself. Getting to Meteora from Athens: you can take the train or the bus, or you can rent a car. If you go for a car rental, you may want to stop by Delphi on your way to Meteora, to see the ruins of this ancient temple. Make sure you have at least one hour for Delphi, because the site is huge and you’ll need to climb to get to the top of the hill. There will be tourist buses, so the place will get crowded. Nonetheless, only a small percentage out of all people climb to the ancient stadium on top of the hill. Get there for a cool panorama of the valley. If you don’t want to drive, the train is perhaps the best option to get to Meteora from Athens. 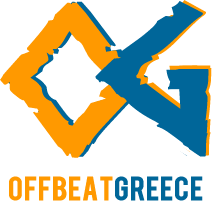 You need to take the Athens Metro Red Line to Anthoupoli, and get off at Larissa Station. If you come straight from the Airport, you’ll be on the Blue Line, and you’ll change at Syntagma. If you are in the center of Athens, just get to Syntagma Square and take the Red Line metro directly. From Larissa Station, you have to take the train to Kalabaka. I’m not sure how they spell it in Greek, but you should know it is the same as Kalampaka or Kalambaka. Once you’re on the train, you can relax and even take a nap, because Kalabaka is the end of the line. Keep in mind that the train ride takes almost five hours each way, so make sure you have snacks and water with you. They should serve some refreshments in the train, but I’m not very sure, so you’d better be prepared. 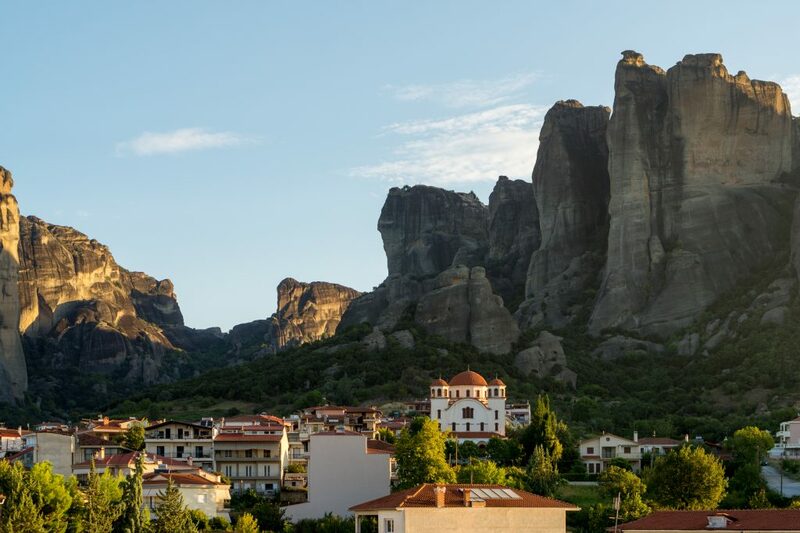 Check out this full day train tour from Athens to Meteora Monasteries, and book it here. You’ll travel by train by yourself, meet the guide and the other members of your group in the Kalabaka train station, and get on a luxury minibus for a 3.5-hour tour of the Meteora Monasteries. 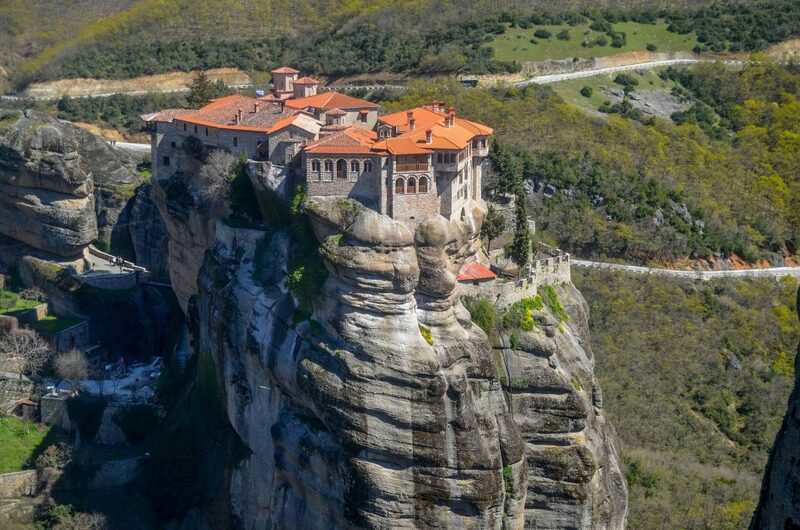 You’ll visit all 6 clifftops, but you have to keep in mind that not all monasteries are open every day, so you may only visit one or two inside. Anyway, the most spectacular thing about Meteora is the scenery with buildings on clifftops and huge rocks carved by water and winds. If you want to take a bus to Meteora, you need to take the Metro (Green Line) to Kato Patissia station. You can take the Green Line Metro at Monastiraki, and you need to head towards Kifissia on the Green Line. At Kato Patissia station, you have to get off the metro and either walk or take a taxi to get to the Liossion Bus Station. The distance is of 1km, so walking shouldn’t be a problem, unless you’re in a hurry or you have physical constrains. At Liossion Station you’ll take a bus to Trikala, which is the big town nearby Kalampaka and Meteora. From Trikala, you have to take another bus to Kalampaka. All these are a bit tricky, as you need to change too many buses to have a comfortable trip. 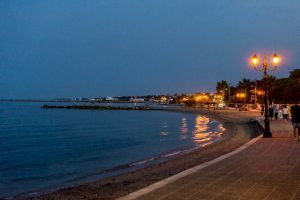 As there are over 400 km from Athens to Kalampaka, you can expect the travel to take 4-5 hours, without taking into consideration the waiting time. If you are a group of maximum 7 people, you should check out this private tour from Athens to Meteora, here. 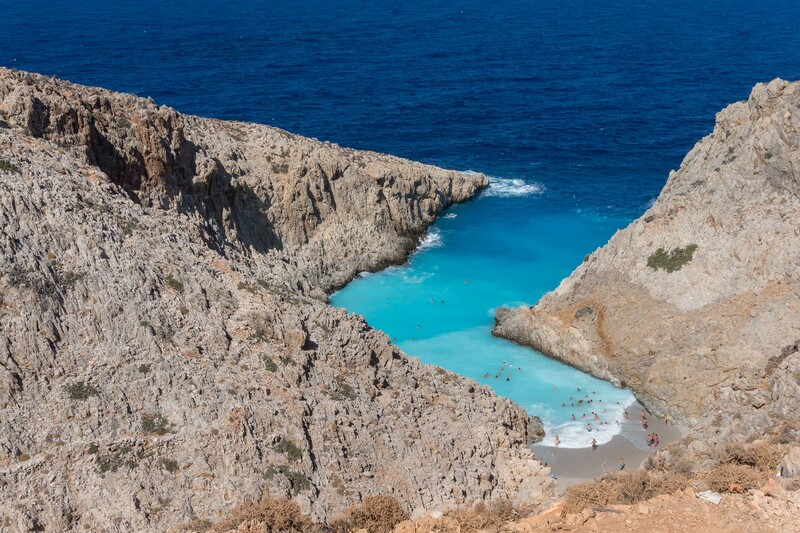 The driver will pick you up from your hotel, and you’ll embark on a full-day trip that includes also a delicious Greek lunch. There are many flights from various cities in Europe to Thessaloniki. While Thessaloniki is a beautiful city, the best part are the day trips you can take from here. Getting to Meteora from Thessaloniki by train is easy. Trains depart from the New Railway Station, or “Neos Sidirodromikos Stathmos” which you can reach by public bus or by taxi. You’ll need to take a train to Kalampaka, which is the last station on this line. As most trains from Thessaloniki to Kalambaka switch at Palaeofarsalos, you’ll need to stay tuned until you pass this point Also, the return train timetable in advance, so that you can plan your visit to the monasteries. The bus is a great option to get to Meteora from Thessaloniki. You have to get to the KTEL bus station in Thessaloniki. There are many city bus lines that take you there, so you won’t have a problem with that. From this bus station, hop on a bus to Trikala, and then take another bus to Kalambaka. Should you be willing to spend one night in Kalambaka or Trikala, you can take an evening bus from Thessaloniki (I think the last one leaves at 9pm. The journey takes about 2.5 hours. If you’re keen on traveling by train, you can buy your tickets in advance here. If you prefer the bus, you’ll pay your fare to the driver. If you are by car, keep in mind that some portions of the travel are on toll roads. I found it funny that they charge you 2 Euro every few kilometers instead of letting you go as far as you need and charge you the total amount when you exit the motorway. 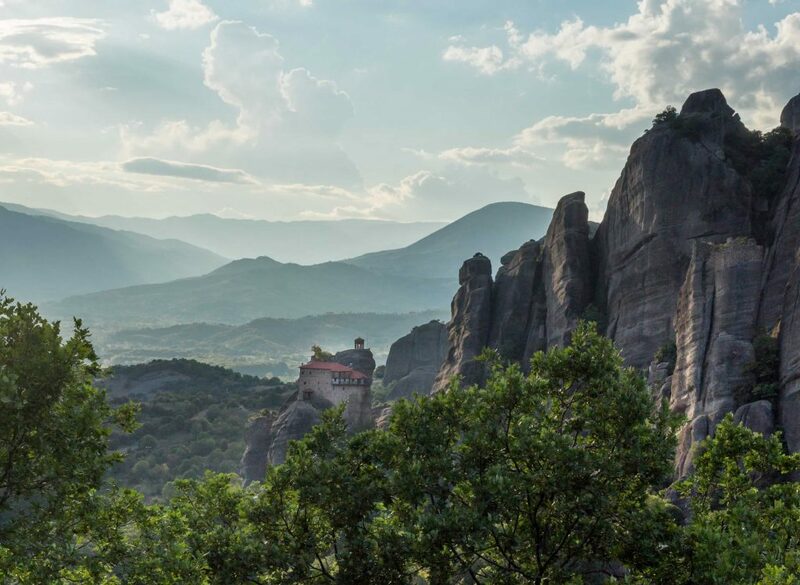 Click here to book your spot on this bus tour from Thessaloniki to Meteora. You won’t have to bother with anything, just relax and enjoy your guided tour. Peak season is between July and October. 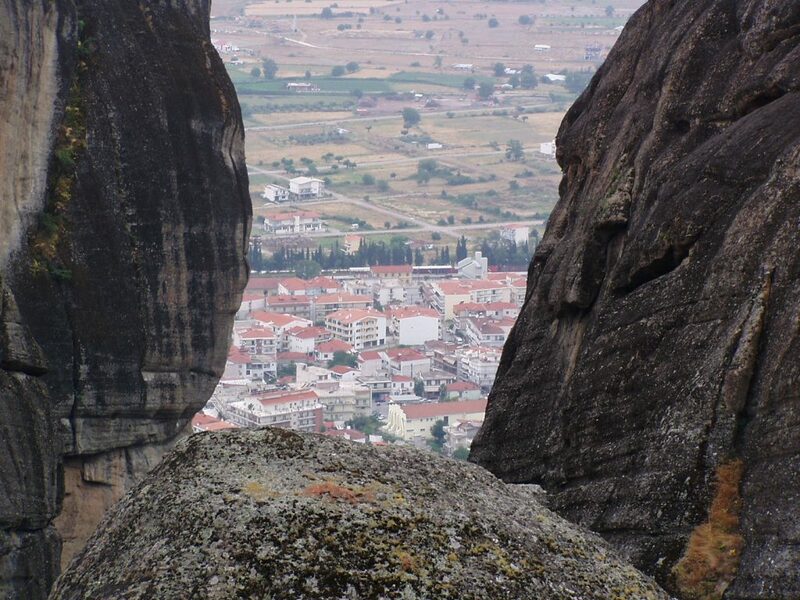 If you want to avoid the crowds, you can visit Meteora in the beginning of June or mid-October. Nonetheless, you should keep an eye on the weather forecast, as it can get quite rainy during these months. I’ve been to Meteora in June and I’ve been lucky. Although it was overcast, it didn’t rain a lot, so I had a great time visiting the monasteries. Unfortunately, most photos from that tour came out dull. However, if you’re lucky to get to Meteora on a sunny day, you’ll experience one of the most amazing sunsets you can imagine. Late fall could also be a great time to visit, as the foliage changes from green to a rainbow of warm colors, creating an epic scenery. As the winter opening hours are different from the summer ones, you should check the schedule before planing your trip to Meteora. Here are a few photos I’ve taken on my second trip to Meteora, in early September, on a lovely weather. 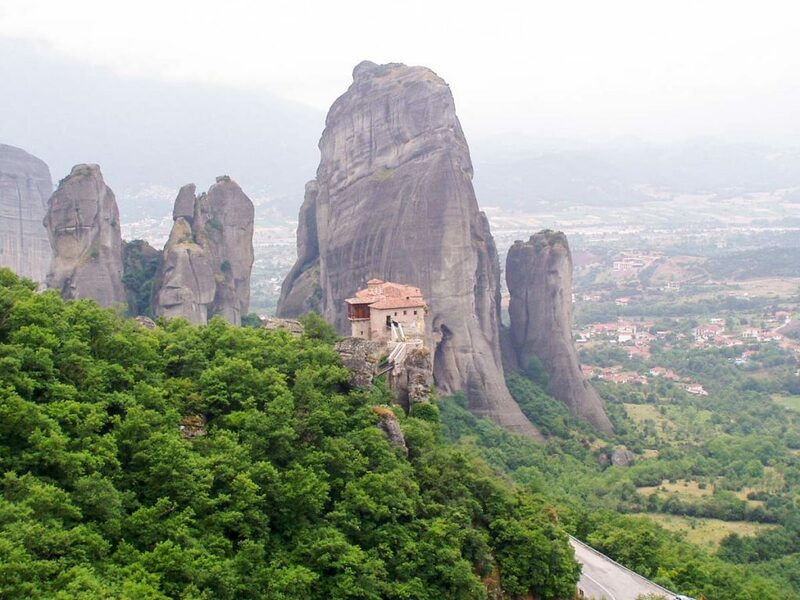 Out of the 21 Meteora monasteries, only six are still erect today. Two of them are nunneries, the other four being inhabited by monks. If you want to visit all of them, you’ll need 2-3 days. The trail between the monasteries is quite long. Besides, not all monasteries are open every day, so you won’t be able to see them all in one day, even if you forget about hiking and go by car. There are also other interesting landmarks in the Kalambaka area such as the Byzantine Church of the Assumption of Virgin Mary and the prehistoric cave in Theopetra. 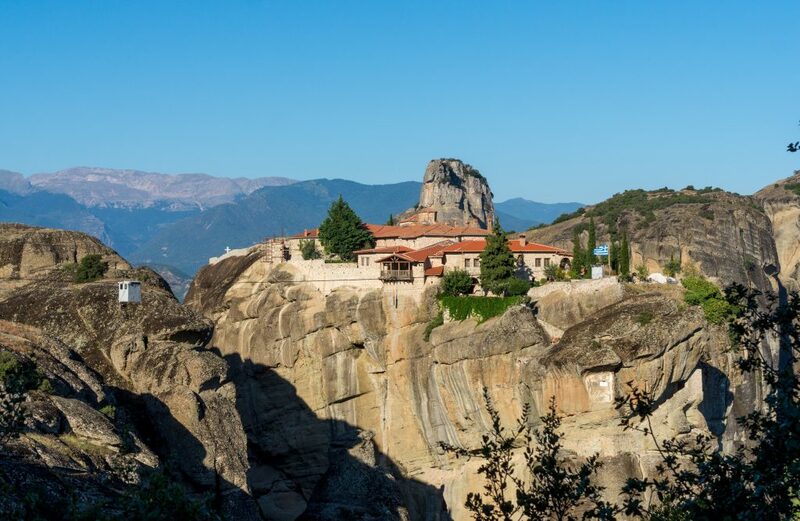 Located on the southern edge of Meteora, Agios Stefanos is the closest monastery to Kalabaka. The access is very easy thanks to the stone bridge that connects the monastery with the main road. Nowadays the bridge is permanent, as opposed to past times when it was mobile. The easy access, with no stairs to climb, makes the Saint Stephen Monastery accessible to travelers with walking problems. The Agios Stefanos monastery is closed on Mondays. 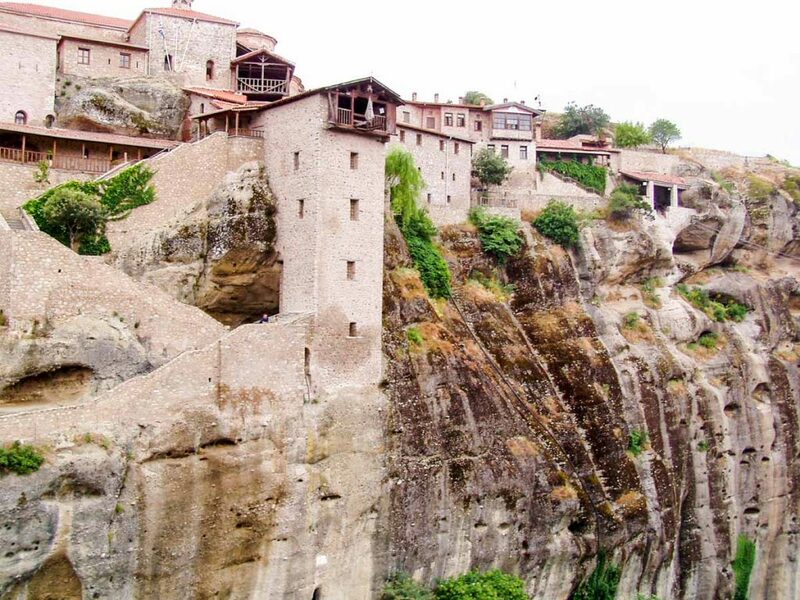 The Great Meteoron is the biggest of the Meteora monasteries. Easily accessible by car and bus, it is almost always packed with tourists. I’d suggest you either get there before 9am or skip it altogether. The Great Meteoron Monastery is closed on Tuesdays. For some reason, Varlaam is my favorite monastery in Meteora. Its history goes back in time to year 1350, when the priest and monk Varlaam built a small church and a few dwellings on top of this rock which served him as home. Unfortunately, after his death, nobody took care of those constructions, so they eventually collapsed. About 200 years had to pass until the brothers Nectarios and Theofanis climbed this rock and built another church on the ruins of the old one. Today, Varlaam monastery has three churches. It shelters some beautiful frescoes, ancient pottery and various holy items. This Greek monastery also boasts a big library. 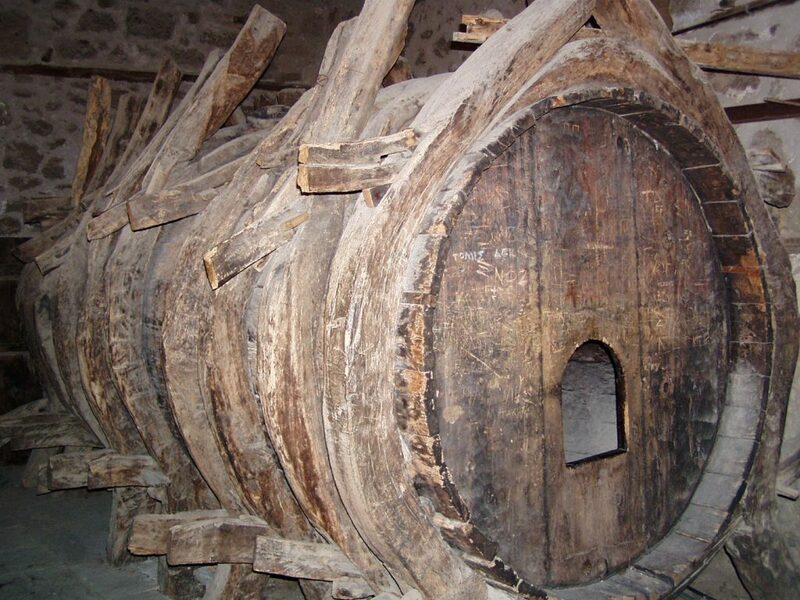 Water storage in Varlaam monastery, Meteora Greece. I was sure they used it for wine, but the books say it was water all the way. The Varlaam Monastery is closed on Fridays. If you want a station point for stunning images of Meteora and of Varlaam and Metamorphosis monasteries, Roussanou is the place to go. 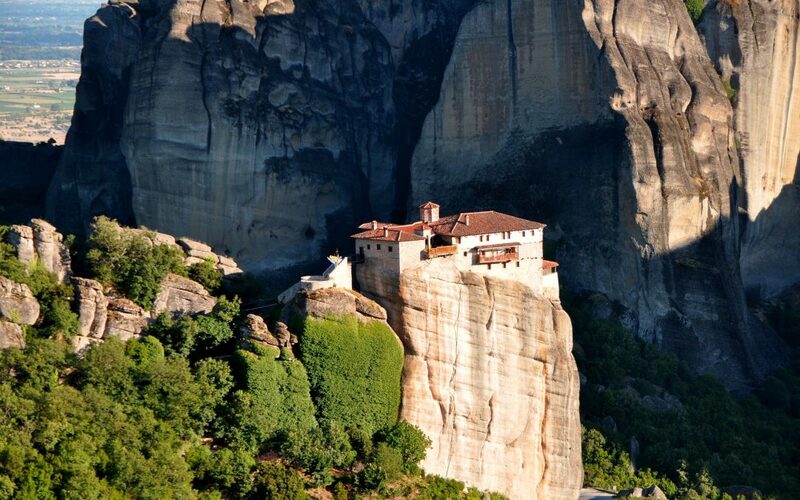 Located on a relatively smaller rock, this monastery is easier to access than many others. If you get to the Holy Trinity monastery a few minutes before 9am, you’ll be able to see the cable car in motion (and take some cool photos). Unfortunately, the cabin is completely closed and made from metal, so there’s nothing spectacular about it other than the fact that it slides on those ropes. Nonetheless, this is one of the best places to start your tour from. Although the monastery seems very difficult to get to, don’t let yourself intimidated by that. The stairway is carved into the rock and it isn’t too steep. If you don’t have any disabilities, you should be able to climb it without problems. I’ve seen a lot of seniors doing it. 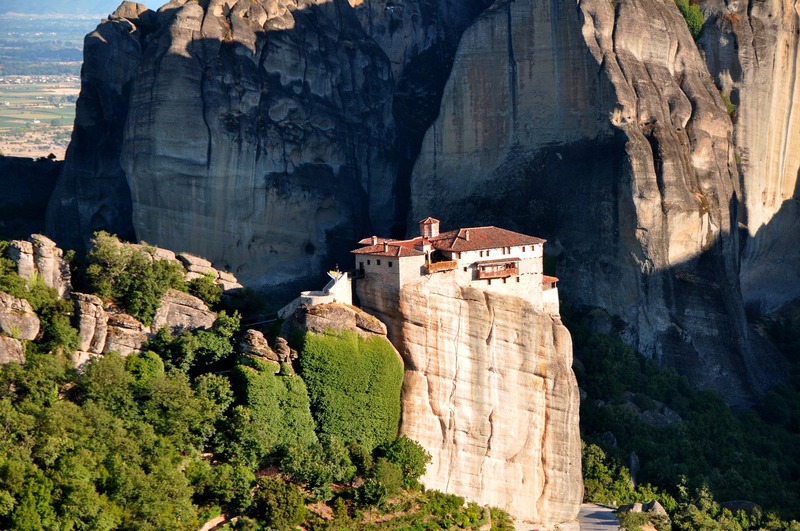 As it is the first one to access when you come from Kalambaka, this monastery is hard to miss. If this is your first time to Meteora Greece, you’ll probably stop for photos, as you’ll be impressed with the dramatic scenery. I don’t have any good photos of Saint Nikolaos Anapafsas, but I’ll be there in less than one week. Meanwhile, keep an eye on my Facebook page where I’ll post photos from my road trip across mainland Greece. This holy monastery is closed on Fridays. If you want to have a good choice of hotels and restaurants, you should get accommodation in Kalambaka. If you want to be even closer to the monasteries, you should try to find accommodation in Kastraki, the village nearby Meteora. I’ve been reading on some websites that Kastraki caters mainly to those who love a rural style accommodation. However, I found it to be quite developed, so I’d say it is for all types of travelers. How would you like a room with a view like the one above? 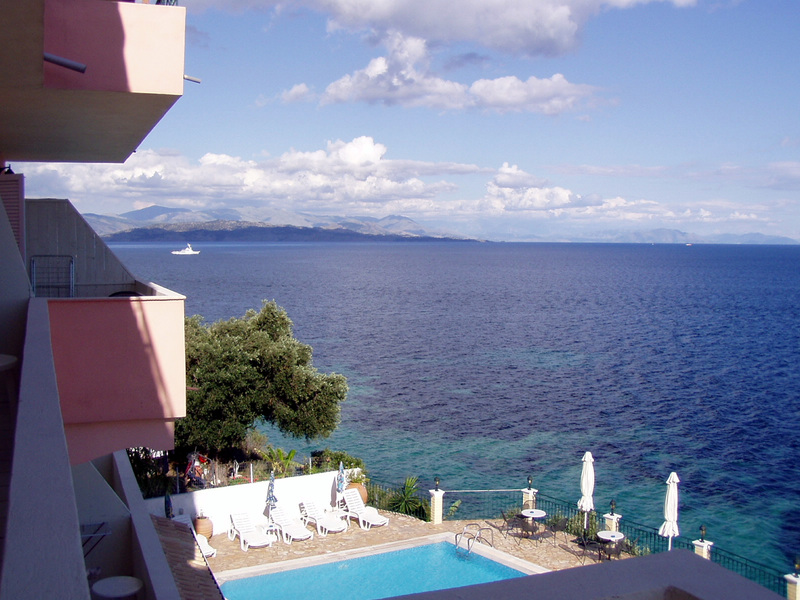 That was the view from my room in Kalampaka, hotel Kosta Famissi – find the current rates and book a room here. 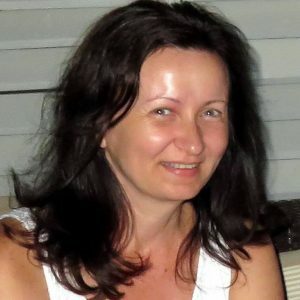 Organized Tours to Meteora or Self-Guided Trips? This is a tough one. On one hand, getting to see the Meteora monasteries with a guide will enable you to find out lots of details and historical facts, while also enjoying the breathtaking views of this place. On the other hand, doing your own thing enables you to stop wherever you like and to customize your tour as you wish. Here are a few Meteora tours you may want to take a closer look at. Even if you don’t book any of them, they can serve you as planning guide, as they can help you understand how much time you need to visit each monastery and what else to visit in the area.